Fiddler on the Roof. Chanhassen Dinner Theatres main stage. Dinner and show, $62-$82; show-only tickets available only 10 days prior to reservation, $47-67. (Special student rates are available for students ages 5-17.) For schedule or reservations, call 952/934-1525 or visit www.chanhassendt.com. Within each person is waged an internal struggle between what is comfortable or acceptable within the constraints of the social order and what challenges at the edges of that order. As political beings, arguments can quickly erupt over politics or religion and the “slippery slope.” Only in artistic productions can we approach such questions openly, willing to be challenged and even changed. Fiddler on the Roof, a play based on the stories of Sholem Aleichem (with book by Joseph Stein, music by Jerry Bock, and lyrics by Sheldon Harnick) may be the supreme popular portrayal of this struggle. Its haunting though familiar tunes and emotionally-dense lyrics are as timely today as they were when the show premiered 47 years ago. This is Fiddler’s fifth run at the Chanhassen Dinner Theatre (but the first in 20 years), and artistic director Michael Brindisi has nailed it. 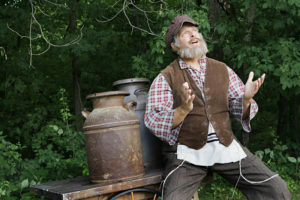 Keith Rice’s Tevye is exquisite. His vocal and volume ranges (from whisper to yell) astound, easily filling the theater. Nayna Ramey’s set is stunning. (I spent much of intermission starring into the shadows and corners, finding nearly hidden gems.) Choreographer Tamara Kangas Erickson uses every inch of the stage to free the passions of the actors, as the ecstatic dancing heightens the clash of cultures. Uneven accents sometimes distracted me, pulling me back from the magical world this dynamic ensemble created.